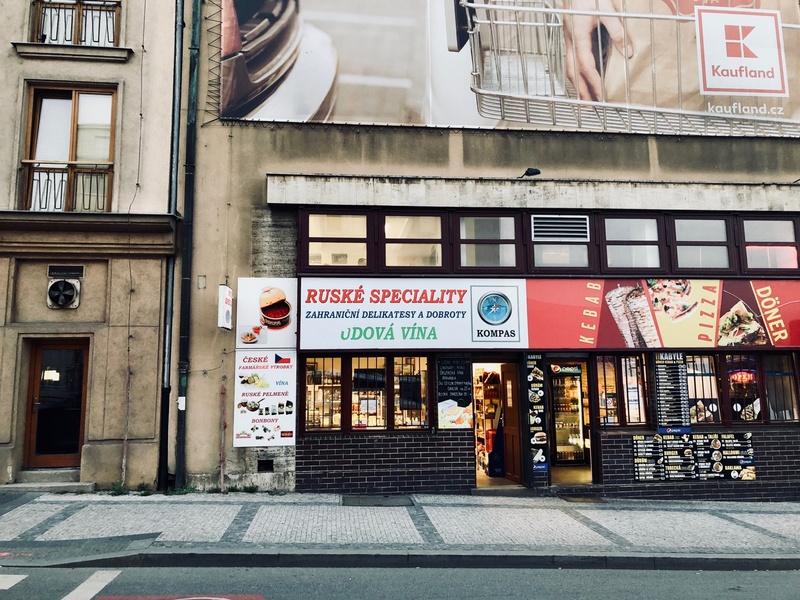 Last week’s blog post was on the Russian enclave of Kaliningrad, but in retrospect, I didn’t have to travel 600 miles (1,000 km) to the north in order to find “A Little Piece of Russia in the EU.” All I had to do is walk out my Prague front door. I live in a part of the city – Bubeneč – that’s informally known as “Little Moscow” because of all the Russian institutions located here. In the past, I never paid too much attention to this. After all, Bubeneč is Prague’s diplomatic quarter, and there are foreigners of all stripes -- including me -- hanging around the place. A recent news article, though, spurred a chain of events that showed me just how extensive the Russian presence in my neighborhood really is. It's eye-opening -- really. In this post, I'd like to take you on a walk around so that you can see for yourself. Top Photo: The leafy entrance to the Russian-government-owned development agency, Rossotrudnichestvo. 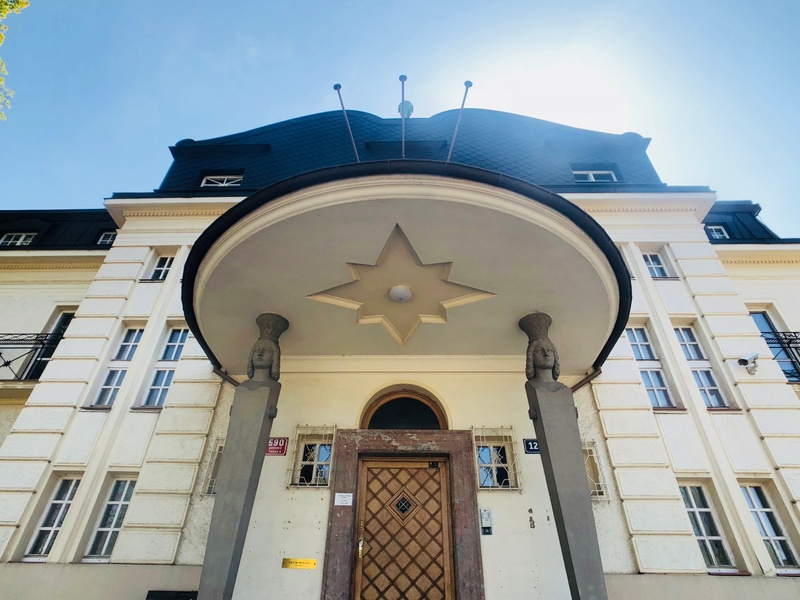 If Michael Cohen -- U.S. President Donald Trump's lawyer and fixer -- came to Prague in 2016, it may have been for a meeting in this building. Photo by Mark Baker. 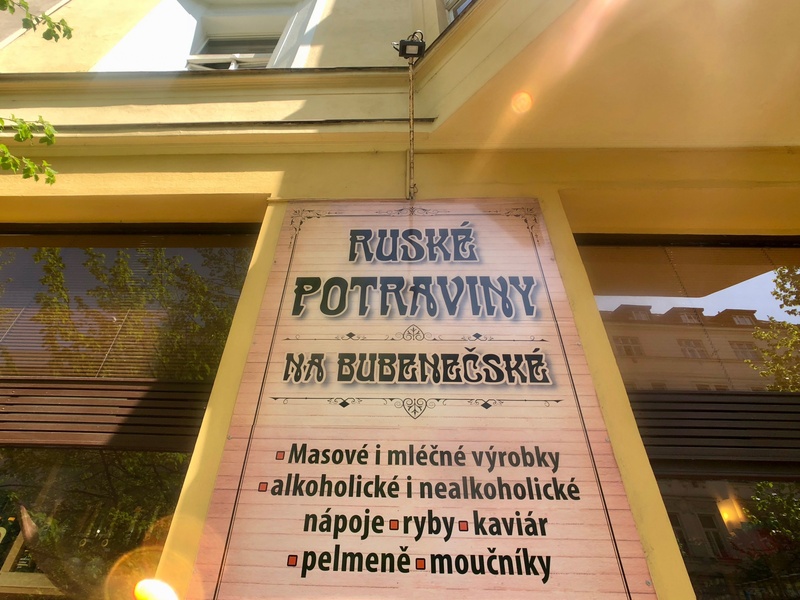 Posted in Life In Prague, Tales From The Past and tagged Architecture, Bubenec, Cohen, Czech, Czechia, Prague, Russia, Trump. It's hard to overstate how enormous the Russian Embassy is. It was built in the 1920s by the wealthy Petschek family and designed in a neo-Baroque style by the Petcheks' favorite architect at the time, Max Spielmann. This is the same family and architect, by the way, who built the nearby American embassy residence. Photo by Mark Baker. The gate to Russia's impressive embassy compound. The main building is toward the back. The driveway empties out at the entrance to one Prague's prettiest parks, Stromovka. Photo by Mark Baker. 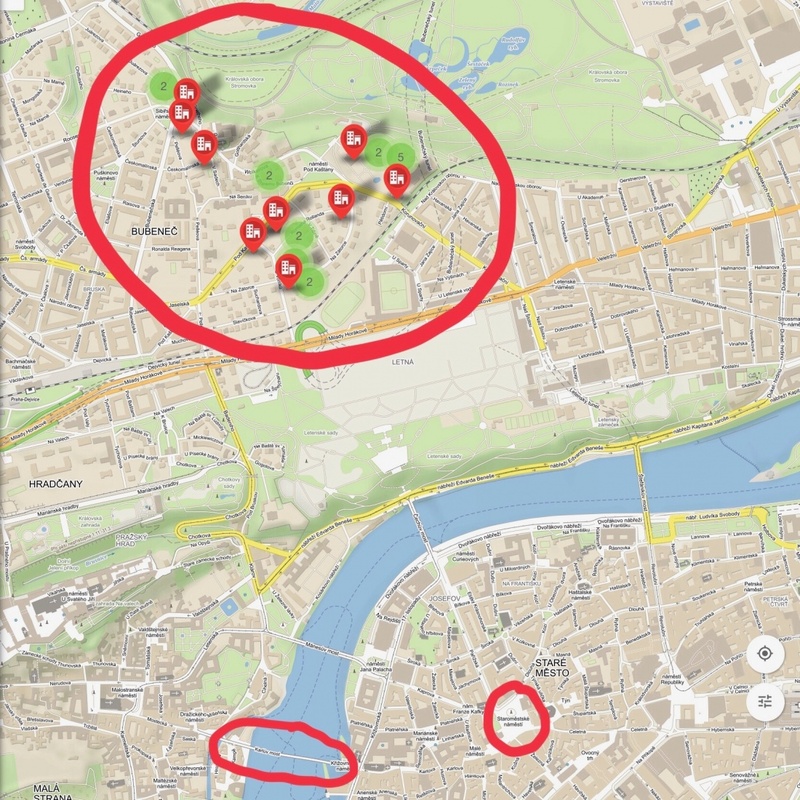 This screenshot, from a map created by Hlidacipes.org, shows the concentration of Russian-owned buildings in my neighborhood of Bubeneč. As a point of reference, I've circled the locations Prague's Old Town Square and Charles Bridge below. Oddly, the news article that got me thinking about this Russia thing had little directly to do with Russia’s presence in Prague. It was an article about U.S. politics. To be more specific, it was about Michael Cohen, the personal attorney for U.S. President Donald Trump. According to the report, by the U.S. news agency McClatchy, Cohen may indeed have visited Prague in the summer of 2016 to meet with some Russian officials – in spite of his strong denials to the contrary. In the past, Cohen has stated categorically he’s never been to Prague in his life. I’ll spare you the ins and outs of American politics, but state simply that Cohen’s visit -- if it happened -- would be a big deal. Trump has been vocal in insisting, since his election in 2016, that his campaign did not collude with Russia. Any confirmation that Cohen, Trump’s personal friend and fixer, had met with some Russians in August of that year -- in a place Cohen denies ever visiting -- would look highly suspicious. 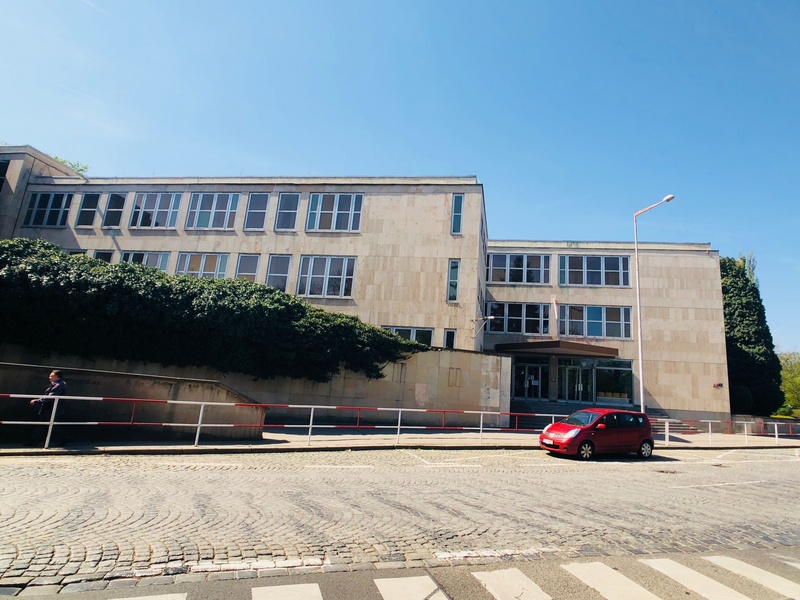 The report said the Prague meeting took place at a Russian-government-owned development agency called Rossotrudnichestvo. 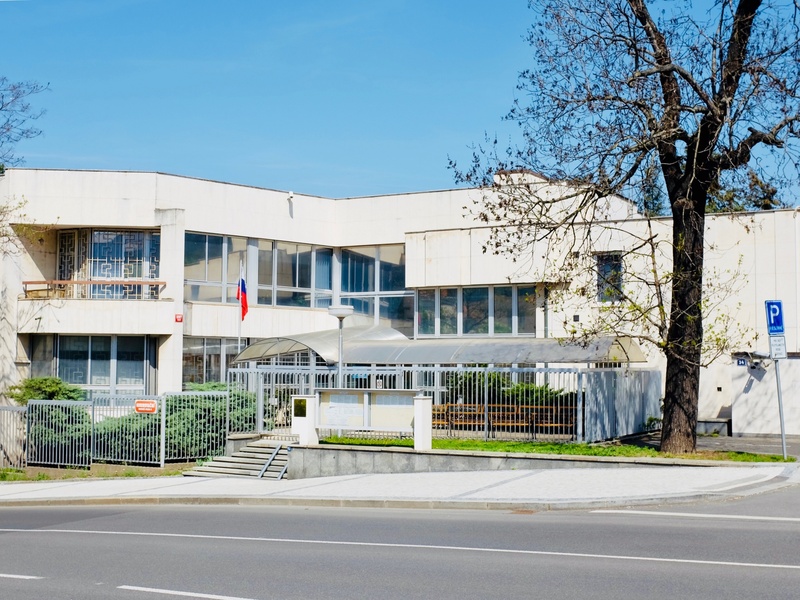 I googled around one morning on my laptop in my kitchen and found Rossotrudnichestvo’s local office was located at the "Russian Center for Science & Culture." The address was Na Zátorce 16, less than 10 minutes on foot from where I was sitting. If Cohen really had been in Prague, I wanted to see where. Another view of the exterior of 'Rossotrudnichestvo.' Coffee, bake sales, and bored moms on benches ... at least on my visit. Photo by Mark Baker. 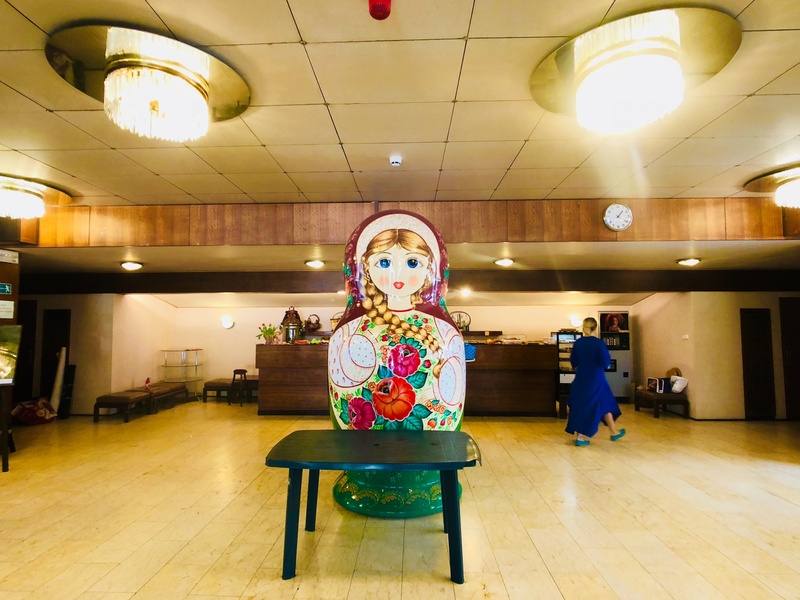 The first thing you notice as you walk into the ground-floor lobby of Rossotrudnichestvo is a giant matryoshka doll-looking thing. Photo by Mark Baker. How many other cities in Europe can boast of a square named after Siberia (in Czech: Sibiřské náměstí)? This was where I started my mini-tour of the Russian splendors of Bubeneč. Photo by Mark Baker. One of those glorious Communist-era statues is situated on the lawn of the Russian school. I'm not sure it has anything to do with anything, though it does set the mood. Photo by Mark Baker. As readers of my blog will know, I’m always up for one of these spy-vs-spy adventures. 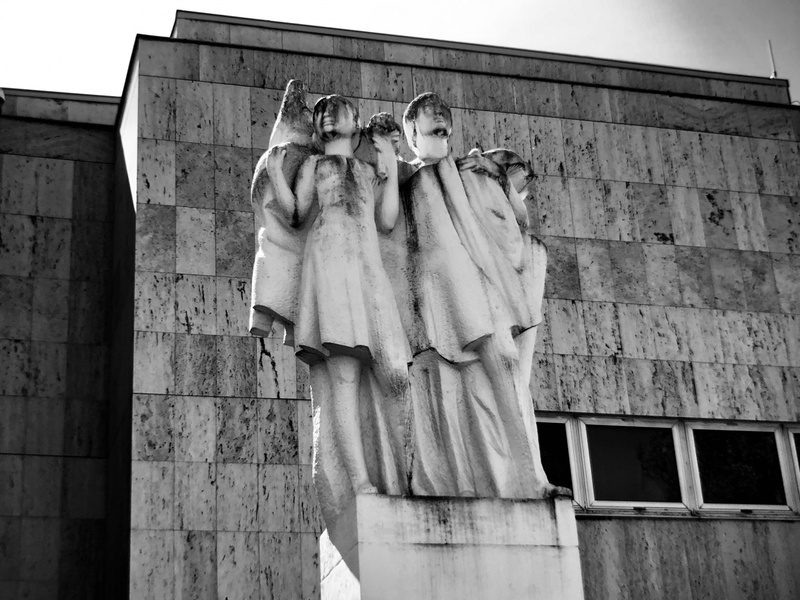 I grabbed my camera and headed over to the Na Zátorce address, not quite knowing what to expect. Russian institutional names always look so sinister (no matter how innocent the function), and the name “Rossotrudnichestvo” sounded tailor-made as the setting for a secret, high-level meeting. Though I live close to Na Zátorce street, I don’t spend much time in that part of the neighborhood. 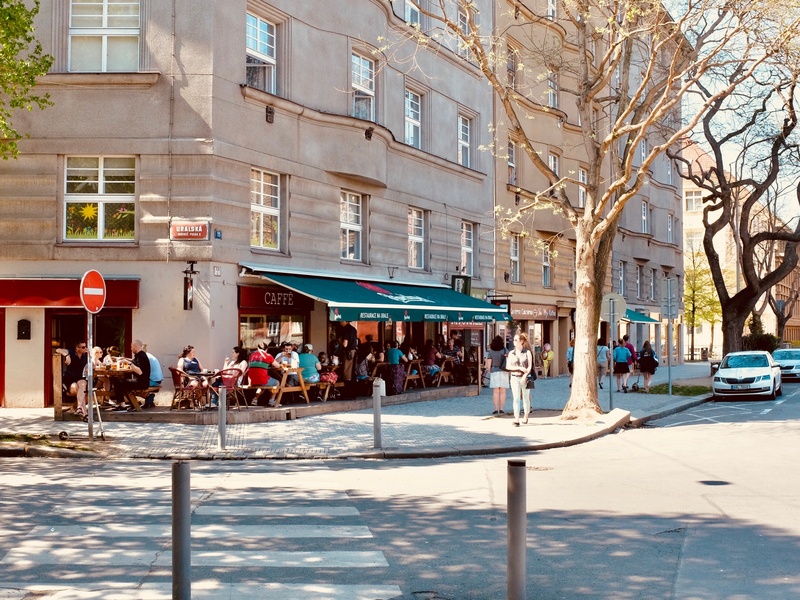 It’s a beautiful, tree-lined boulevard of sprawling two- and three-story villas from the 1920s and ‘30s, when Czechoslovakia was a newly independent republic and one of the wealthiest countries in Europe. The street was out of my way, and more importantly out of my price range. I doubt if many Prague residents, even now, know it exists. I strolled casually down the sidewalk -- my camera slung around my neck -- and pretended to be just another clueless visitor who’d gotten separated from his tour group. I considered carrying a guidebook to complete the picture but figured that would be a bit extreme. My plan was to snap a few surreptitious photos from the street and tail it back home. When I got to no. 16, though, I was a little surprised. Instead of a spooky-looking villa, hidden behind gates and high hedges, the building that housed Rossotrudnichestvo’s offices looked very much like what it was supposed to be: a cultural center. The building had one of those arty, forward-looking ‘60s facades that all public institutions back then seemed to have. Kids were playing in the yard and a couple bored moms were sitting on a bench outside. The front door was open, and I popped in to take a look. Toward the back, there was a small coffee counter; on the left, a table where some ladies were holding a bake sale. The walls were covered by some tired-looking displays of Russian scientific achievements. An oversized Russian nesting doll -- a matryoshka doll -- dominated the center of the lobby. I have to admit I felt a little let down. There wasn’t a stocky guy with a bad haircut or a black, Kremlin-registered “ZiL-111” limo anywhere in sight, and no one seemed to care as I snapped my photos. This was supposed to be the secret meeting place? I wondered vaguely to myself what Michael Cohen must have made of that giant nesting doll in the lobby. I've walked past this amazing circular pavilion hundreds of times and I never knew what it was. It now houses a Russian Orthodox Church, St. Ludmila. Before, it belonged to the trade mission of the Russian Federation. Photo by Mark Baker. 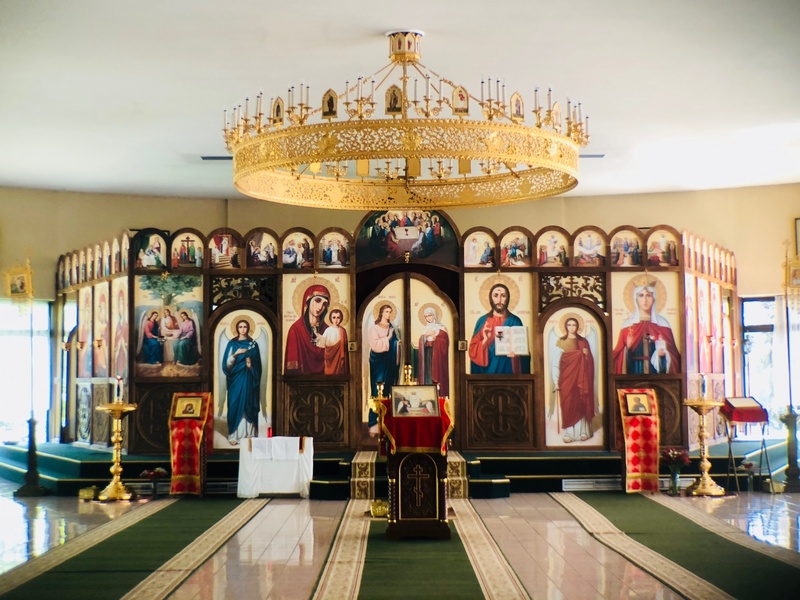 Inside the circular setting of the Russian Orthodox church of St Ludmila. The building has now functioned as a church for the past few years. Photo by Mark Baker. Prague's Russian school stands just off of Siberian Square (Sibiřské náměstí). Photo by Mark Baker. 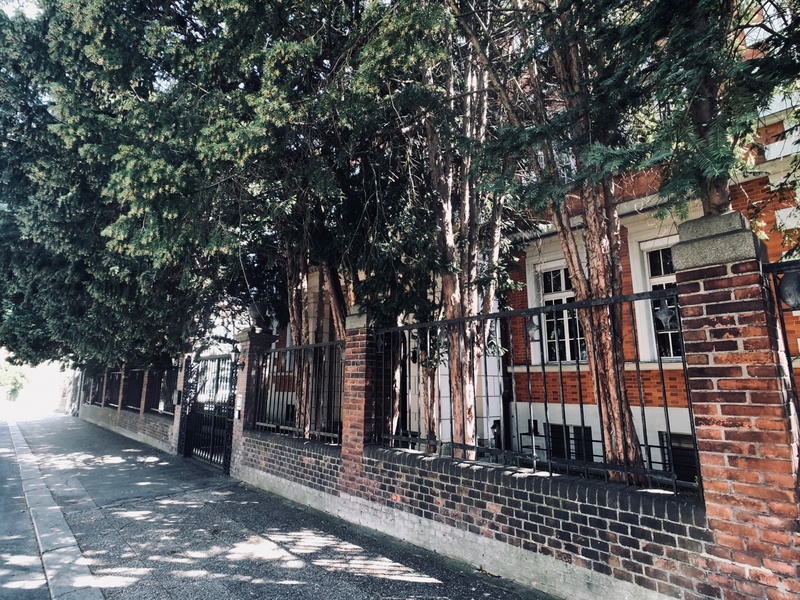 This residential or commercial compound, situated just behind the Russian school, along Českomalínská street, appears to be partly abandoned or at least little used. Photo by Mark Baker. 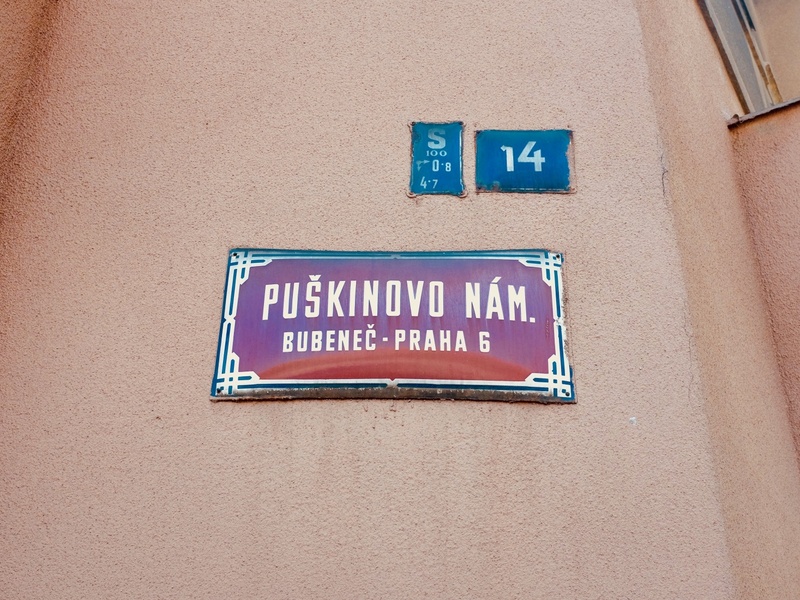 Even though the Rossotrudnichestvo visit was something of a bust, it got me thinking about Russia and Prague, and particularly about my own neighborhood. If there was a Russian “Center of Science & Culture” here, what other types of buildings or institutions were located on the streets around my house? I really had no idea. At about this same time, I happened to see a tweet by my fellow-Prague blogger Sam Beckwith from his @PraguePig account. The tweet was a link to an article by the Czech “Institute of Independent Journalism” (Ústav Nezávislé Žurnalistiky) that concerned, coincidentally, the same subject that had been on my mind. 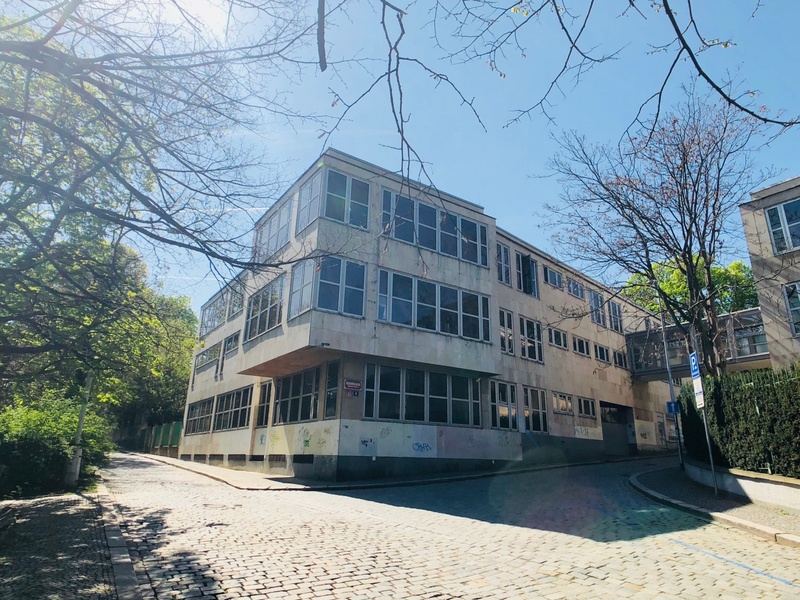 The article Sam linked to was titled “Prague Bubeneč as Little Moscow” and listed some 26 Russian-owned buildings and properties located in my neighborhood. It included an interactive map that one could follow at his or her own pace. 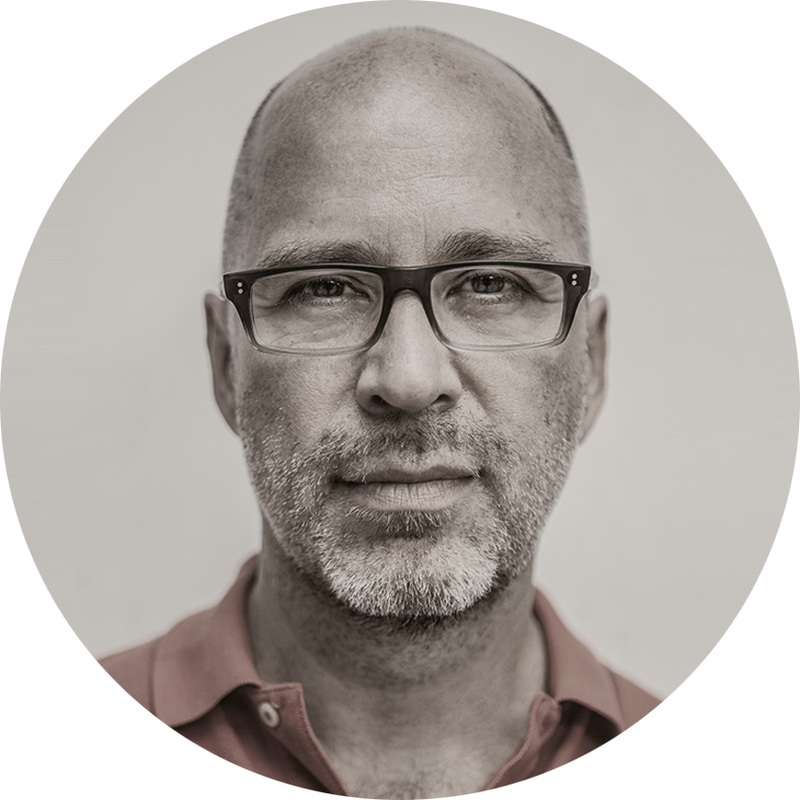 The Institute of Independent Journalism is modeled on ProPublica.org in the United States and seeks to promote unbiased investigative reporting. The implicit question behind the article was why Russia would need such a large diplomatic presence in the first place, and, going further, whether Russia’s properties were being used to carry out solely diplomatic functions – or rather (more improperly) to further the private and commercial interests of Russian (or Czech) entities and individuals. Twenty-six buildings? It was mind-blowing. I had to see this for myself. And so it was on a pretty Saturday afternoon in April that I loaded the institute’s interactive map on my phone, grabbed my camera, and once again set out for a walk around the block. And, yeah, the Russians do own some nice real estate here in Prague. The amazing entrance to the Russian property at Na Zátorce 12, just a couple of doors down from Rossotrudnichestvo. It was closed on my visit, but seems to house offices for several private companies. Photo by Mark Baker. Side view of the impressive entrance to the building at Na Zátorce 12. The sign on the door indicates the building serves as headquarters to several companies, including my old friend JZD Slušovice. Photo by Mark Baker. The main office of the trade representative of the Russian Federation takes up most of the northern side of Siberian Square (Sibiřské náměstí). The gate was closed, though the building appears to be in active use. Photo by Mark Baker. These residential units appear to be affiliated with the trade representative of the Russian Federation on Siberian Square (Sibiřské náměstí). Photo by Mark Baker. I started my tour of “Russian Bubeneč,” fittingly, at Siberian Square (Sibiřské náměstí), just 200 meters from my front door. I pass through this leafy park (it’s not really a “square” in the traditional sense) almost every day, though I’d never associated the name with the Russian community before. Sure enough, according to the map, Siberian Square is an important node of Russian Bubeneč, and the site of a Russian Orthodox Church, the Russian high school, and the headquarters of the Russian Trade Representative. The church, St Ludmila, occupies a striking, circular pavilion once used as a showroom by the trade representative. The school is larger than it appears from the front and there’s a long-neglected communist-era statue standing on the side. 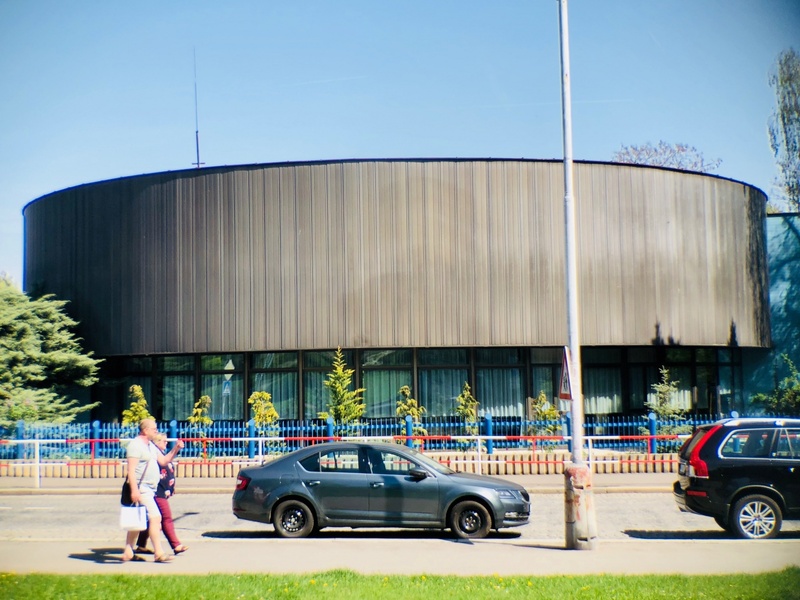 From here, I proceeded behind the school and along Českomalínská street, passing beside a large group of Russian-owned housing complexes. Russia’s holdings are extensive, but by no means are they all luxurious. 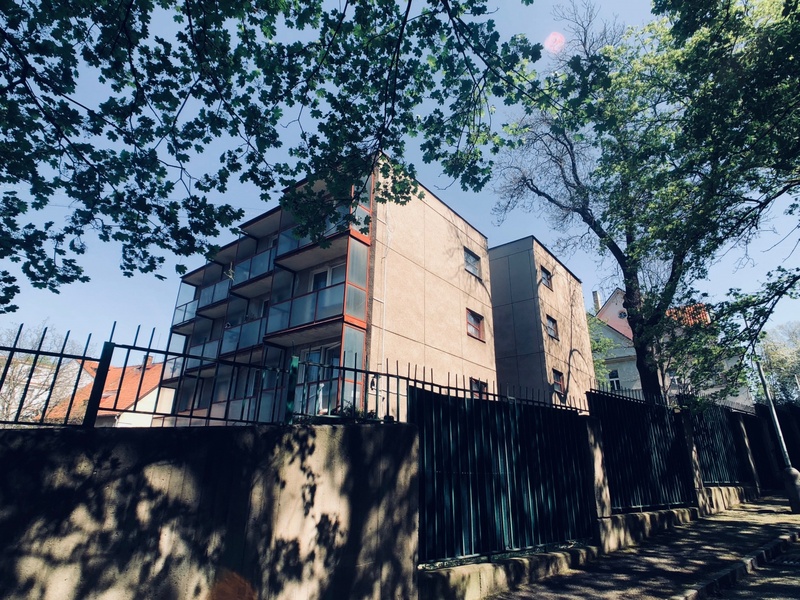 Several buildings in this area and at another cluster, along K Starému Bubenči street, are simply ordinary Socialist-style apartment blocks you’d find in any Czech town or city. From here, I made my way slowly toward the massive Russian embassy complex, about 300 meters southeast of Siberian Square. The embassy’s main building is a hilltop neo-Baroque town palace built in the 1920s for the wealthy Petschek family. The Soviet Union acquired the building at the end of World War II, and after 1991, control of it passed to the Russian Federation. Much of the building remains shrouded in trees and set back behind intimidating fences, but here and there, through the openings, you can glimpse the building’s sheer scale. 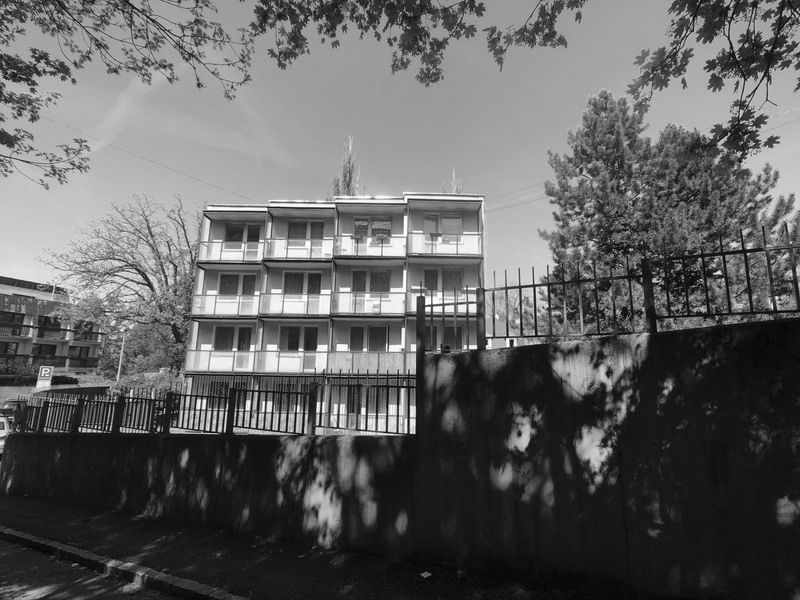 The complex, which runs at least a couple hundred meters in length, includes numerous outbuildings and the Russian consular offices. Na Zátorce street begins just opposite the embassy and runs south for about 300 meters. 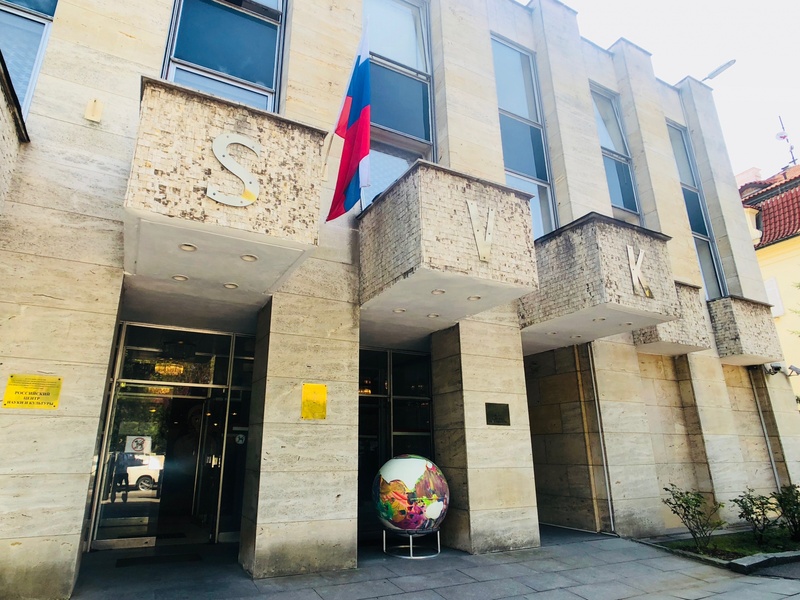 This street and adjoining Romaina Rollanda street are home to the Russian Federation’s most prestigious holdings outside the embassy complex itself. 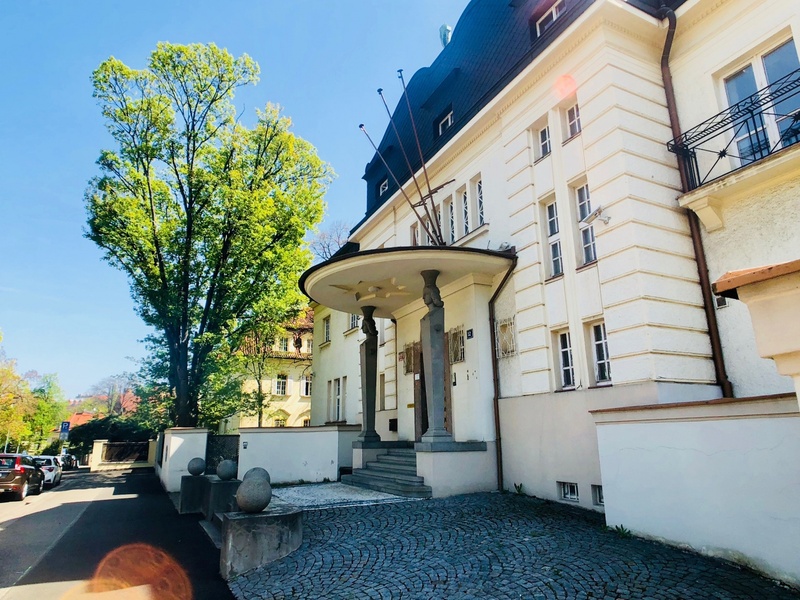 These buildings include, in addition to the offices of Rossotrudnichestvo, several breathtaking interwar villas -- one of which, at Na Zátorce 9, once belonged to former Czech President Edvard Beneš. As I walked along and ticked off the properties on the map, I tried to peek through the windows or look for signs on the houses for clues as to what went on inside. I was surprised to find that some of the villas, including a yellow-brick house at Romaina Rollanda 12 and another brick beauty at Romaina Rollanda 4, looked to be abandoned or at least badly underutilized. The few houses that did have signs appeared to support the Institute of Independent Journalism’s contention that, indeed, some (or even many) Russian-owned properties are being used for private or commercial purposes. 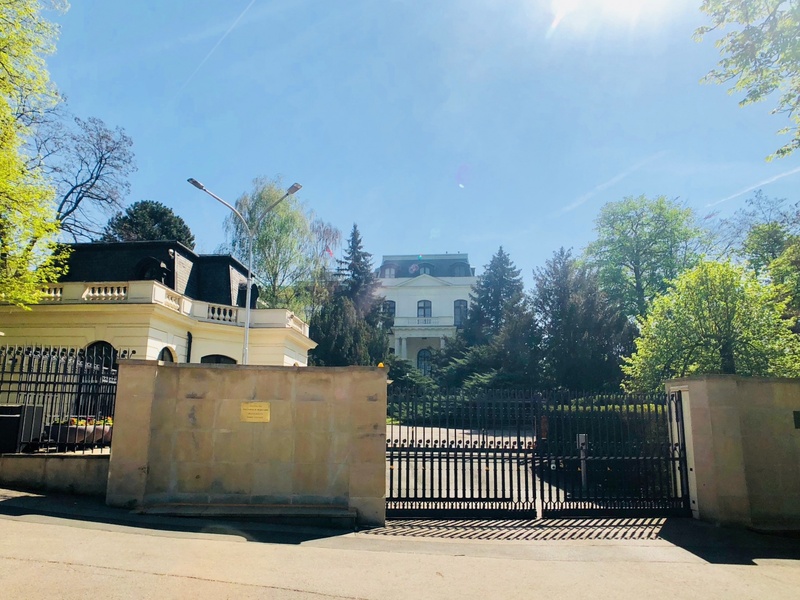 I was shocked, for example, to see that the far-right political group, Hnutí Řád Národa (Order of the Nation), maintains an office at Edvard Beneš’s former home. 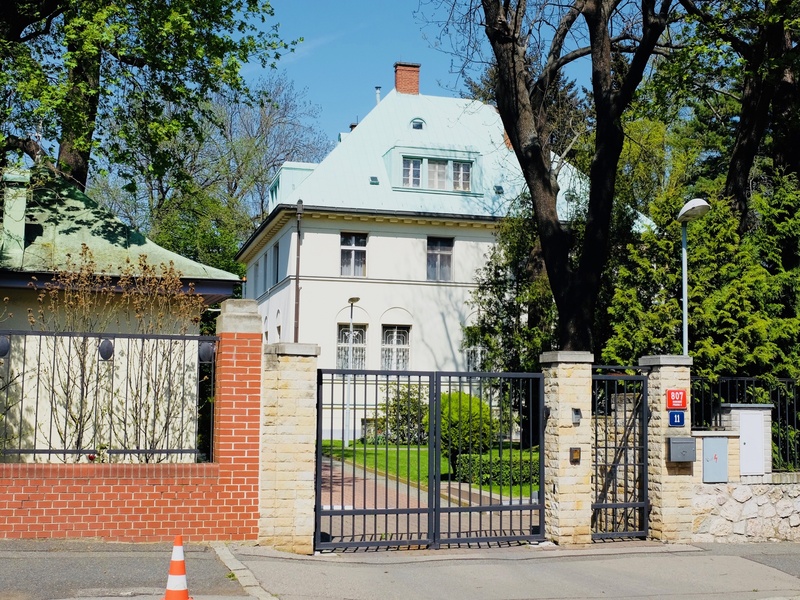 Just across the street, at Na Zátorce 12, another villa appears to house the local headquarters of the agricultural firm JZD Slušovice. 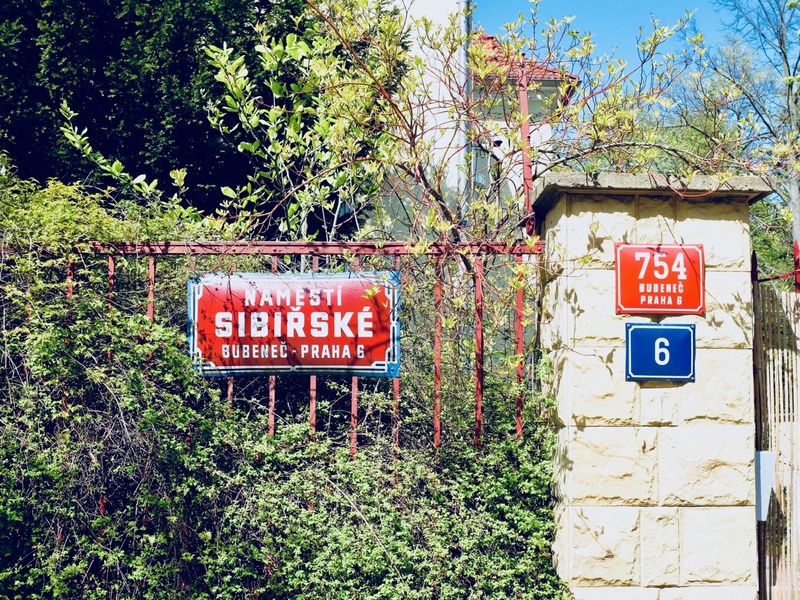 This this may well be the same JZD Slušovice that I wrote about in an earlier post: a shady, Communist-era collective farm that I thought had long been discredited and liquidated. I finished my tour of "Little Moscow" at picturesque Pushkin Square (named for Russian writer Alexander Pushkin) and eventually made my way home. Putting aside all of the diplomatic hanky-panky that Russia may be carrying on here in my neighborhood, it should be noted there are some distinct advantages to having lots of Russians all over the place. I considered stopping by at one of my favorite Russian grocery stores on the way home to pick up some vodka, smoked fish and red caviar. Say what you will, but Russian caviar, at least, is much better than the local Czech equivalent. This building, tucked away on K Starému Bubenči street, looks like residential units for embassy staff or guards. I've lived in the neighborhood for 10 years and I never even knew the street existed. Photo by Mark Baker. 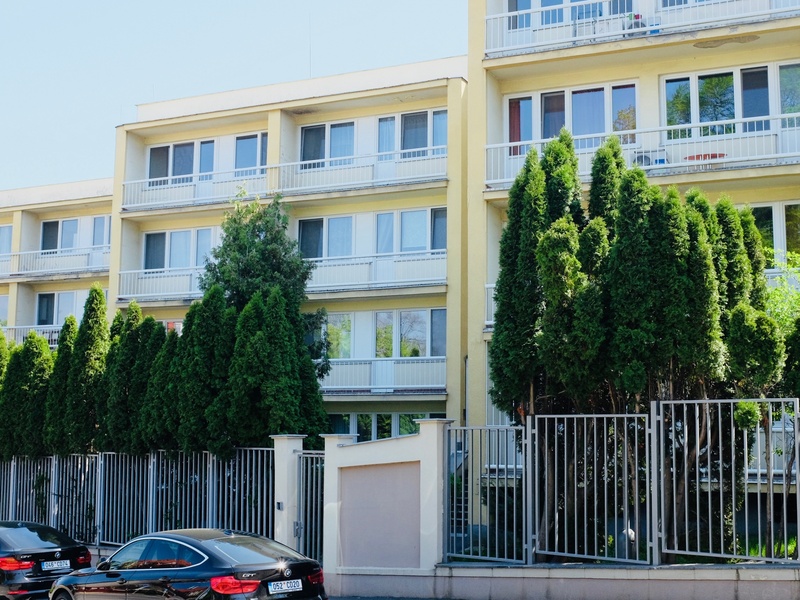 Another group of residential buildings, probably for the embassy or delegation staff, sits just off of Wolkerova street, where it meets with K Starému Bubenči street. Photo by Mark Baker. The consular offices of the Russian Federation. 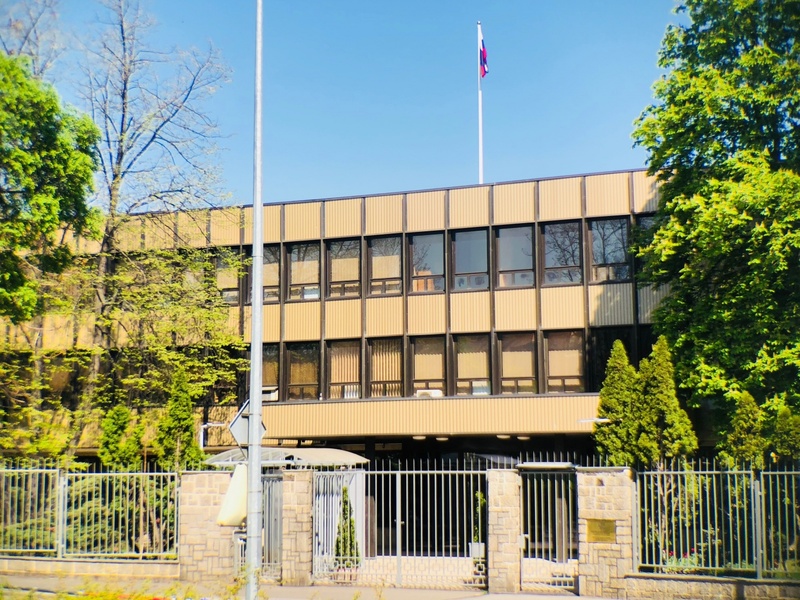 This building sits beside busy Korunovační street and forms part of the enormous main embassy compound. Photo by Mark Baker. One of the many mystery buildings that belong to the Russian Federation or its affiliated organs. Locked gate, no signs, no idea what -- if anything -- happens behind these walls. 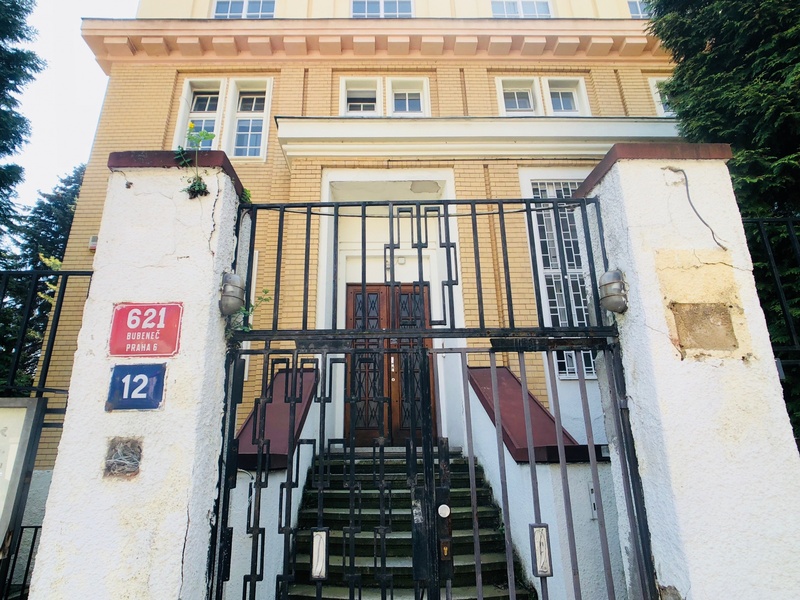 Find it at the corner of Na Zátorce and Romaina Rollanda streets, about 50 meters from the Russian Embassy. Photo by Mark Baker. My walk through Bubeneč took me along some paths I had never known about. 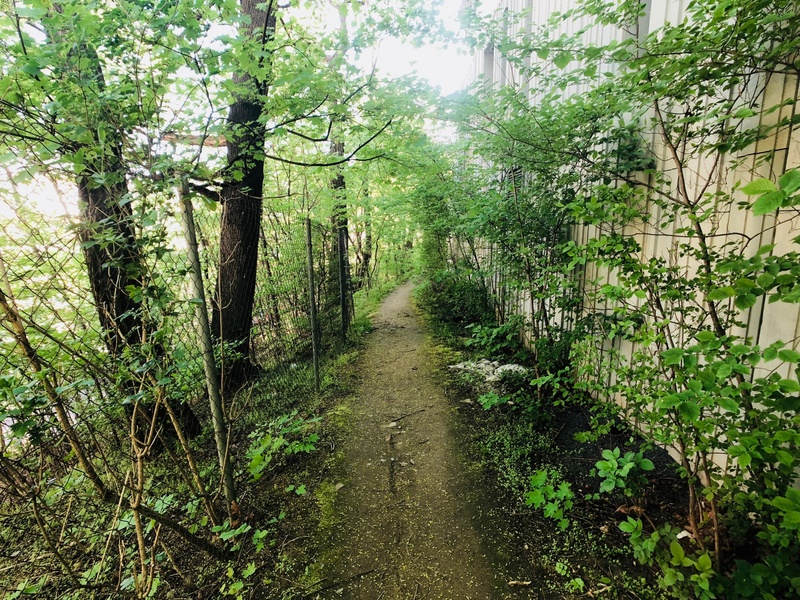 This quiet stretch of wood lies just above the Russian-owned housing complex at K Starému Bubenči street. Photo by Mark Baker. I was wracking my brain to figure what goes on here behind the pines at a genuinely sinister-looking building at Romaina Rollanda street no. 4. Photo by Mark Baker. 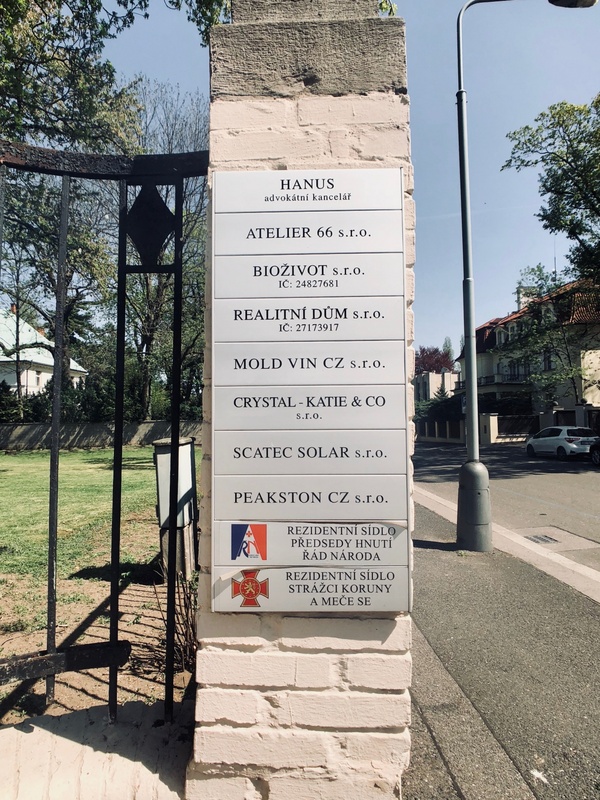 The sign at Na Zátorce 9, a villa which once belonged to former Czech President Edvard Beneš (1884-1948) and his wife, Hana. Apparently, there's a wine-importer here now as well as the seat of a far-right political group called 'Order of the Nation' (Hnutí Řád Národa). Photo by Mark Baker. 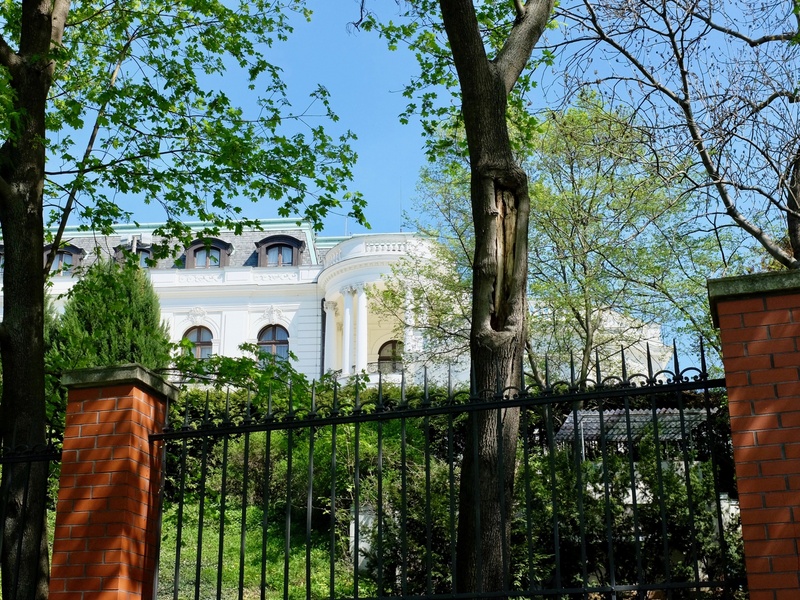 This Russian-owned villa is almost directly across the street from Rossotrudnichestvo at Na Zátorce 11. It was closed and unmarked on my visit. Photo by Mark Baker. Not far from Siberian Square, the commercial heart of Bubeneč, Pushkin Square (Puškinovo náměstí), is named for the Russian writer Alexander Pushkin. Photo by Mark Baker. A typical spring Saturday on Bubeneč's lively Pushkin Square (Puškinovo náměstí). Photo by Mark Baker. One of dozens of grocery stores in Bubeneč that specialize in Russian foods. Photo by Mark Baker. This little Russian convenience store is very close to my apartment. Handy when I want to buy Russian dumplings, vodka, or some real sour pickles. Photo by Mark Baker.